One of the most common questions I am asked is, “What Content Management System (CMS) should I use for my website?�?. The short answer is, that there is no short answer and there’s certainly no simple one! Choosing a CMS really comes down to what it is you need to achieve with your website and what it is that you need to be in control of. There are hundreds of CMSs to choose from, all with their own individual capabilities and functionality. For some, a simple basic CMS will be enough to manage their brochure ware type website, but others require more flexibility and functionality. A lot of web developers will be able to guide you toward the CMS that they feel suits your requirements best. But in a lot of cases, the web developer will usually suggest a CMS he/she is most comfortable using. A Content Management System is basically a piece of software that allows non-technical users to manage their website and its content. Through a CMS, website owners have the ability to add text, upload images, videos and documents to their website at their leisure without the intervention of a web designer. A CMS takes away the technical knowledge required to update and manage a website by creating an easy to use interface. With some CMS’s, it can be as easy to create a new webpage on your website as it is to create a new Word document. Content Management Systems were born in the mid 1990s when web designers, bored with the laborious task of updating massive content heavy websites, decided it was time for change. They went about creating simple systems to help maintain the websites they created for their clients. Originally these systems were built for in-house use only and it was only a matter of time before they realised that there was a market for such a product. Nowadays, it’s common practice for web design companies to install Content Management Systems (CMS) on all websites they develop. Even if you haven’t request a CMS from your web designer, it’s quite possible they have installed one already… mainly for their own sanity! The first major decision you will be faced with when deciding what CMS you should use is whether you should buy one or use one of the many freely available open source CMS’s. In the Open Source arena, there are hundreds of free CMS’s . Being free obviously has massive benefits, but it also brings its problems too. Because the software and its core code are freely available, it’s more susceptible to security and hacking holes. For this reason, choosing a CMS that is regularly updated and patched regularly is of key importance. Generally speaking, CMS’s developed in-house by web development companies will occur an annual license fee. Developers of “off-the-shelf�? CMS’s are likely to charge you a one off fee for its use and offer you free updates for one year. You shouldn’t assume that because you have chosen to use a free CMS, there will be no costs involved in getting up and running. The simple fact is that there will still be costs associated with getting it integrated with your website. Your web developer is likely charge you for the time it takes to install and integrate the CMS with your website design. If you have chosen a commercial CMS, some companies may waive the integration fee, but you will still have to pay to get a design capable of working with the CMS itself. It’s really worth researching the cabilities and functionality of all available CMSs before deciding on which one to you use for your website. Here is small list of some of the most popular CMSs. An enterprise level CMS that offers full flexibility and expendability. Typo3 is freely available to download and use under the GPL License agreement. Typo3 has a good choice of enterprise extensions and plugins available. Joomla is an award winning content management system. Favoured by a lot of developers for it’s easy installation and management capabilities. Joomla’s biggest downfall is probably its popularity. The fact that so many people use it, makes it more prone to abuse from malicious coders. Favoured by bloggers as the tool of choice, it is now fast becoming a popular tool for managing smaller websites. A huge collection of third party plugins are freely available. 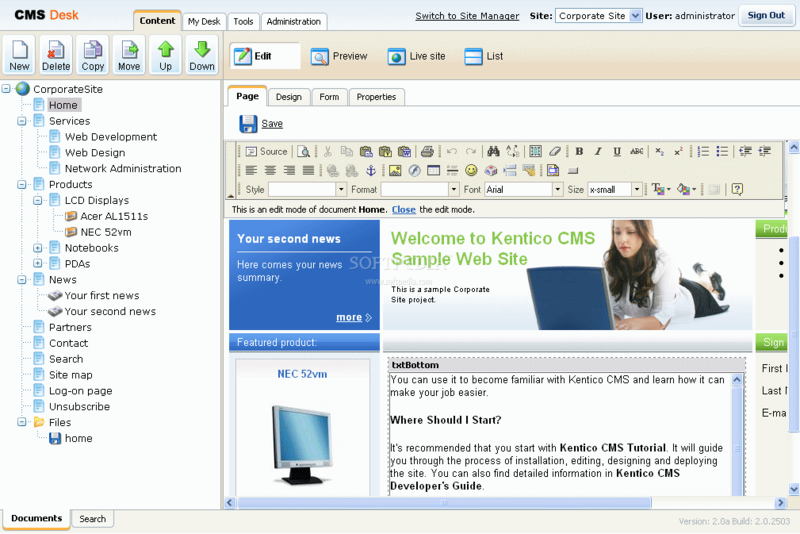 An affordable Content Management System that is feature rich and flexible. Kentico is another flexible solution and favoured by developers who are used to developing Microsoft ASP.NET applications. In this day and age, every business should have a website. It doesn’t matter if you are a one man operation or a multi-national plc, your website could be one of the most cost effective sales leads generation tool you have ever had for your business. Of course, you need to take some important steps to ensure your website is generating the proper level of interest in order to get a maximum return. Most of my working life is spent preparing quotes or speaking with people about getting a website. I constantly here the phrase “I need a website, how much will it cost? I hear it some many times that my structured brain would love to have a process in place where it could just spit out a one liner that will answer that question in an instant. Unfortunately for me, it’s not that simple. There are so many things you can do with a website, that it’s impossible to gauge how much work is involved in a project without going into detail. Out old cliched response is obviously “how long is a piece of string”. This isn’t about us looking to sound smart, but more about it being the easiest way for us to get out point across. Of course there are many projects that can be very straight forward, you know the ones, a 5 page website with a reply form. We could usually give you a ballpark figure on this type of website pretty quickly. Generally speaking, those people that want a website of this nature tend not to want to make much of an investment in their website and are looking for a cheap and nasty solution because they believe they “have to” have a website. They tend not to be that interested in trying to achieve a return on this investment and really just want a “presence”. Do I think this is the right approach? In some cases it’s fine – like how much information can you really say about a one man electrician company? The lack of competition in the search engines for something this specific could make it a worthwhile investment for this business. But what happens when all the other electricians come on board and also get themselves a simple website? Very quickly there will be a lot of businesses in that space all fighting for the top positions on Google. In most cases a properly thought out website is the only way to go. Do you need to have a CMS? Do you need to interact with visitors to your website? What do you want to achieve with your website? How will it handle sales for your business? These are all questions that you should really be asking yourself when planning the development of your new website. Cut to chase Tom, how much will it actually cost me to build a website? Well again there are many variations. A typical brochure site with 5-10 pages will cost you anywhere from €300 (from a cheap and nasty web design business) to over €3k (from a professional web design company). Once you start getting into bespoke application development, the cost can increase quite quickly into the 10s of thousands. Working with the right web design company will help you get the most from your website. They will be able to guide you as to where you should put your money and effort for the best return. Typo3.org website accessed by unauthorised person! Change your passwords! Hot off the press, I just got an email in from Typo3.org stating that their website has been accessed by an unauthorised person. The unauthorised person had access to all the username and passwords of those that have an account with the Typo3.org website. Apparently this person has passed on this info to third parties and has also been gaining access to websites who stupidly use the same password. So if you use the same password for everything and have an account at Typo3.org – I suggest you quickly change your password! We have to inform you that an unauthorized person has gained administrative access to the TYPO3.org website. The offender had access to website user details including their passwords, and there have been reports of this data being used to access other websites. It also has to be expected that the data may have been disclosed to third parties. The attacker has been identified, and the TYPO3 Association has started to take legal action on the issue. IF YOU HAVE USED THE SAME PASSWORD ON ANY OTHER SITE, PLEASE CHANGE IT IMMEDIATELY! In a first step, all login accounts on TYPO3.org have been locked and will require a new password. We are currently working on an improved login procedure and will let you know when this is ready. Until then, you will not be able to log into the Community section of TYPO3.org. The page may be updated with new questions from time to time, so make sure to check back before replying to this mail. We apologize for the inconveniences and troubles that this might cause to you. How Many Times Have I Given My Password? Need a way to keep your passwords secure?